In stock 149 items in stock. Sale items are not eligible for quantity discounts. This is a very large row of high quality swiss machine pin headers - break to fit. 40 male pins that can be cut to any size. Used with custom PCBs or general custom headers. Why machine pin? Machine pins are round making better contact with IC sockets and connectors. 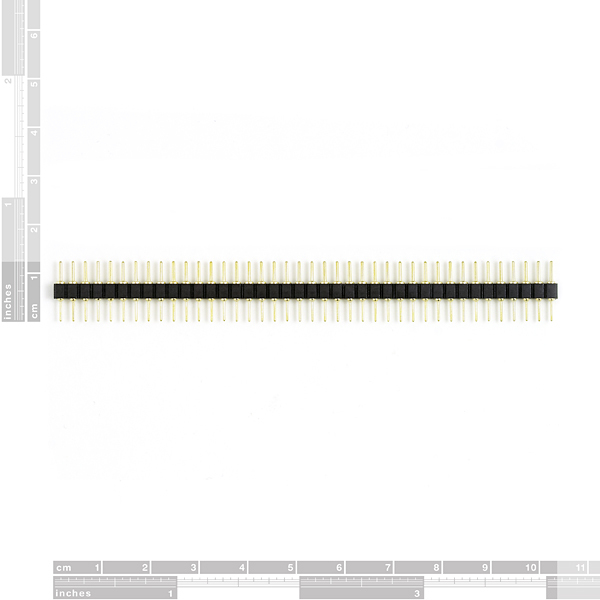 The diameter for each of the pins is 0.50mm. Which side of these (with or without the conical taper) is intended to connect with the female headers, and which side is intended to be soldered to the PCB? Holy crap these are expensive for just 40 pins!!!! Make them cheaper!!!! or add more strips like 5 strips for the price or 10 strips for the price or a little bit more!!! Can you give pin diameter (both sides)? I don't know why people are whining about the price. These would be $14 a pop from the regular electronics distros. Thanks SFE for selling them! Do you know if these headers mate with these sockets? Does anyone know the diameter of the thicker post that extends below the plastic piece, but before the 0.51mm diameter post? I'd like to use these to make stackable PCBs, where the thicker post is embedded in the board, and the thinner post fits into the board below it. yes this is 2+ years late, but the thicker metal near the centre gives an average reading of 1.77mm with my cheapo digi-caliper. What are the other diameters of the pins themselves?? Thanks. How many of these strips do you get for $2.95 ? I'm asking because if it is just one strip, then it's a rip-off. I can a bag of 25 of these strips for $10 somewhere else (not in USA btw). The best generally cost more. And it costs more when you buy one at a time. If you want a better price buy a thousand of them else where. And generally things bought in third world countries are of poor quality. Even if that country makes them for export. The ones for domestic sales are the rejects. Perhaps, but don't hand wave away Sparkfun's tendency to massively overcharge for certain things. They DO buy a thousand at a time. For example their "premium" F/F 6" headers are $4 for 10 while on Adafruit the same exact thing is 40 for $6. The prices are palatable when you just need one or two but if you really want to stock up on headers, interconnects, and various odds and ends then you will pay dearly here. Maybe to encourage people to buy Sparkfun exclusive stuff (breakout boards, etc...) rather than random bits, who knows. I'm holding off on my next order until these are back in. I really need them to expand my home-grown dev board. Any estimate on when they will be back? Thanks! Note that the machine pin size is too small to make reliable connections with breadboards and jumperwire. These need the larger square-pin header. I use Craftsman's Handi-Cut cutting sheers and this breaks them apart perfectly every time. The top part of the sheers has a straight blade and the bottom part has a flat surface, so you can actually line up the straight blade in the groove between pins and use the flat part to brace the back of the cut. I place the headers towards the tip of the sheers so the angle of the cut is low and the blade comes almost straight down on the groove, snapping them off cleanly. There are similar sheers out there but I haven't seen any others with the blade on just one side and a flat surface on the other and this is what makes these perfect for this. Have you tried using a file or serrated knife to first score along where you want to break it? An old butterknife might do the trick. Once you've scored it, use a pair of pliers to quickly twist the wanted pins off the row. Well, I haven't tried breaking these exact pins apart, but I usually find that gripping the pins on either side of the point where you want it to break and snapping works pretty well. I usually use two pairs of pliers or a vice. You want to snap them apart quickly. Dont hesitate or else the housing is more likely to shatter. If anyone else has a better way, please speak up. The best way to get these apart is to use a hot knife. I bought a cheap 15W iron and a $3 hot knife tip that I use for jobs like this. The corner of every end pin has chipped off 100% of the time so far using pliers/cutters/etc. Luckily this doesn't seem to affect it much - even with a 1mm gap running the complete height of the plastic, trying to separate the pin will bend it before it pops out. I use pliers too... most snap nice and clean. The usual square pin headers just won't fit into many sockets or breadboards, or require a worrisome amount of force ("Am I permanently damaging my breadboard here?") to do so. These guys fit nicely, they're a good length, they look nice, and they're really easy to solder. Since I can cut to the number of pins I need, they're great for odd-sized breakouts, Pro Mini, and many similar uses. Expensive yes, but I can't find them anywhere else and they do a job nothing else can. Great product at a great price. Compare with the "biggies" which are probably 5x or 10x as expensive. Would prefer that Sparkfun had the 64 pin version of this though. These machine pin headers aren't useful very often, they don't go into breadboards naturally or seat themselves as well as the normal male headers, and every time you snap them apart you lose one pin as they fracture there preferentially, not for normal use! 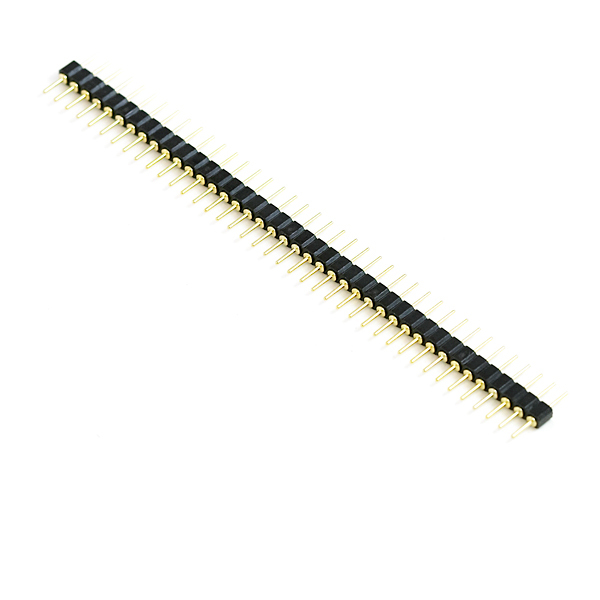 However once in a while you have a product with tiny vias you want to tap for testing, or narrow plated holes, then these are really the only good way to go, stiff short pins, great strength, fit all .1 inch plated holes I've ever found. They do not break clean; one side of the break has a big chunk of stuff, the other side looks like it will have trouble staying in the header. These pins do not retain in a machine socket or make good contact. You have to account for one lost pin per section when cutting these down. A fine set of cutters will greatly improve the quality of cut.